SARAN Jute Products is a Leading reusable Eco friendly shopping bags and promotional bags manufacturer in india & exporter of 100% Eco friendly bags like Jute bags, Jute Cotton Bags from hyderabad. Our product series include Tote Bags, Promotional Jute Bags, Jute Shopping Bags, Jute Beach Bags, Jute Wine bags, Jute Gift Bags, many more. SARAN Jute Products was conceptualized by a group of young entrepreneurs in 2010 HYDERBAD, India, the world's most active location for jute products. Our main target was to protect our environment from the use of harmful plastic bags and now we are spreading our Eco friendly products made of jute, the golden fibre of nature. Jute is totally biodegradable plant based fibre. We manufacture only Eco friendly products, using natural & eco friendly fibres such as Jute, You are welcome to try a variety of our products to watch if they are suitable for your business. We are committed to provide better products as well as services to our clients and this is only possible if we can listen to them carefully and can provide premium quality products at a reasonable price. We are a professionally managed company that believes in customer satisfaction as the key to success. Since we are a manufacturer so we are able to provide best prices as well as better services to our clients. 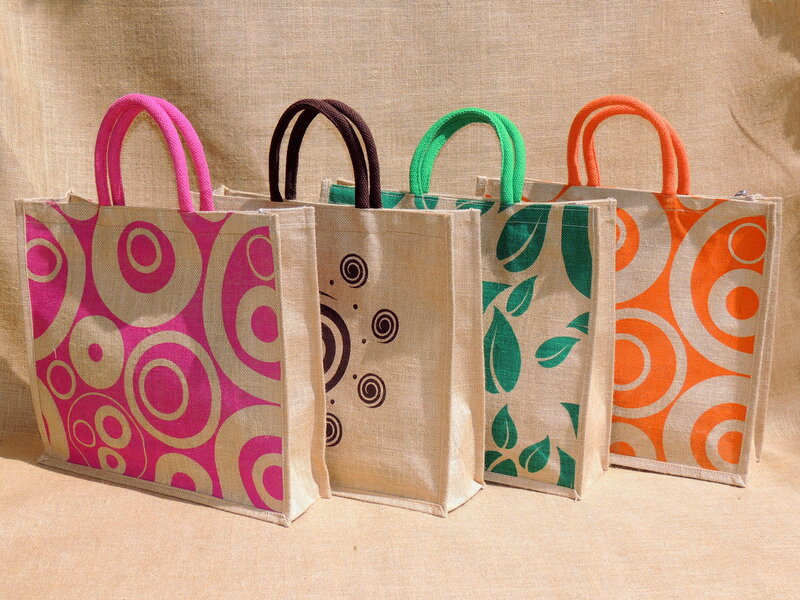 We are leading jute bags manufacturer in hyderabad, India. We are also wholesaler, supplier and exporter of recyclable jute bags and many more. We supply Jute shopping bags, Jute designer bags, Eco friendly Jute conference bags, Jute promotional bags, Jute Laptop Bags, Jute Corporate Bags, Jute cosmetic bags, Jute beach bags, Jute wine bags, Jute laundry bags, Jute garbage bags, Jute Christmas bags, Jute tote bags, Jute wallet, Jute bottle bags, Jute printed bags, Jute gift bags, Ladies jute handbags, Jute fancy bags etc. At SARAN Jute Products, we have a dedicated designing team that can help you in customizing any kind of jute products as per your requirements. We can print your logo or design on our bags to promote your company/brand. You can also choose from wide selection of colours, sizes, shapes, fabrics quality and fabrics type. We carry large variety of bags that appeal to a broad spectrum of users. . Lunch bags for kids it is made up of jute materials and bag colour is in natural and the handles are made with black cotton tape , on the bags, the designe printed of cartoon picture, angry birds. closure-zipper we are manufactures and supplyers from saran jute bags, hyderabad. Products Manufactured Jute Carry Bags Jute Designer Ladies Bags (Handbags). Jute Shopping bags of all sizes and for all purposes. Jute General Purpose Bags. Jute Gift Bags. Jute Beach Bags. Jute Executive Laptop Bags. Jute Tote Bags. Jute Wine Bags. Jute Corporate Promotional Bags. Jute Folders & Files for Corporate purpose. We are the manufacture of jute bags and suppliers, retail and wholesale of jute bags. We do customized design bags and print also to customer. So This place is end of your jute bags needs.